Santa was eating cookies in the north pole when a terrible crisis happened. Frosty the abominable snow man destroyed much of Santa's inventory in the north pole. This threw Santa's schedule off. Santa is now running late and must deliver presents to all the children. In order to save time, Santa is dropping presents into chimneys instead of flying down them. With your help, Christmas can be saved! Instructions: To have Santa throw a present, tap the screen. Tap the screen multiple times to have Santa throw multiple presents. Santa can throw up to five presents at a time. The presents restock on the right side of the screen. 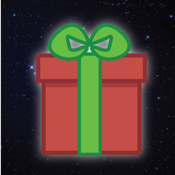 Presents fly towards where you tapped the screen. Santa can unlock special abilities by getting a higher score. Special abilities can be viewed in the Unlockables menu. Santa gets points by getting presents into Chimneys. Santa gets more points for getting consecutive chimneys. Point chains appear next to your score. If Santa gets three or more presents in a single chimney, Santa's points are multiplied. Santa can miss three chimneys, which appear as sad faces to the left. Families know if Santa dropped a present down the wrong chimney, so Santa is forgiven if he gets presents in another Chimney. Small chimneys = 250 points. Medium chimneys = 100 points. Large chimneys = 50 points. 3 Presents in 1 Chimney = 3x Bonus. 4 Presents in 1 Chimney = 6x Bonus. 5 Presents in 1 Chimney = 9x Bonus. Chain Bonus: 1x for every present in a row! Now go deliver some presents!